Another collective reflecting on the actions and non-actions that have created today's Algeria. Each writer is presented as a specialist of the field he or she chooses to retrace. In some cases the author is a well known specialist, in other cases, the writer simply has no more grasp of the matter at hand than any lambda citizen, and simply poses as one. The result is disappointing and makes for a dull read. This type of "reflection with hindsight" is another example of groups with friendly links to publishing houses who blindly edit the work of groups seemingly decided upon claiming they constitute an elite. If the essays were free I wouldn't complain, but these publications are always expensive. 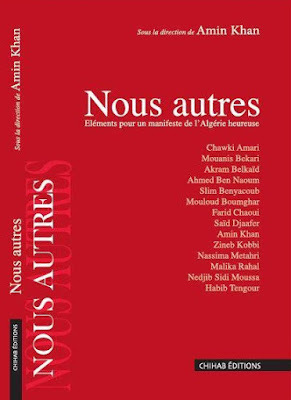 My review on TSA in French: « Nous autres » : l’Algérie du futur et le futur de l’Algérie ?